Director Jewels: Target Bargain, aka Buy All The Applesauce! Once upon a time ago, I was a coupon/deal blogger. Okay, it wasn't that long ago. I started that job about a month before Lincoln's arrival. It was my first venture into the world of blogging - and it taught me a lot about myself, and the way that I work. Ultimately, I figured out that I don't have what it takes to be a deal blogger (those of you who are - you're amazing). I threw out my coupons and haven't looked back. Occasionally, though, I feel a little sad that I'm no longer keeping up with the best deals. When I was blogging about freebies and coupons, my mailbox was always full of free samples and my receipts usually reflected a savings of 40% or more. Whether or not I was actually using any of these free things or fantastic bargains is beside the point. Every now and then I want to start collecting more coupons and do it all over again, but by the time I think about taking the kids into multiple drugstores every week, it doesn't seem worth it. I'm thrilled when I find the occasional deal at a place I already shop - because I can relive the fun of being a bargain hunter without ending up with 19 tubes of expired toothpaste in my stockpile. Last week, Target (aka my favorite place in the world - after Disney and NYC anyway) was offering a mobile coupon deal that was too good to pass up: Spend $40 on select groceries and get $10 off! 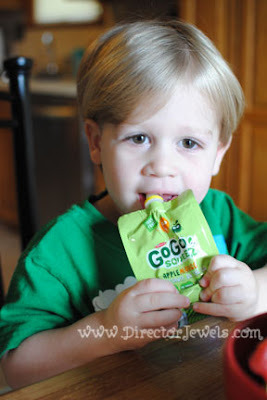 When I saw that GoGosqueez was included on the approved items list, it was a no-brainer. 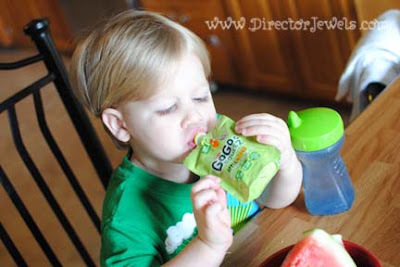 It may not be the cheapest applesauce option, but it's not filled with artificial ingredients and is so convenient. It's also possible that no one but mommy is allowed to eat the Apple-Cherry variety in our home. Is it my best deal ever? No. But I'm happy with the savings because my kids will eat all of this applesauce before it expires. They'll probably eat it all before September! A deal is only a really great deal if it's something that you would buy at regular price anyway - and this one definitely fit that bill. Now if you'll excuse me, I think I'll sneak in some Apple-Cherry for myself while Lincoln is napping! I used to coupon too. Then the Extreme Couponer shows started, and people started committing mass coupon fraud. I got tired of walking into a store only to find the shelves wiped clean five minutes after the sale started. So frustrating! Now I price match at the grocery store. I don't save as much, but still save some! How do you commit mass coupon fraud? There are several ways to commit coupon fraud; a common one is making photocopies of a printable internet coupon - the barcode will still scan, even though you're limited to one or two uses per person. If it was a freebie, people would make tons of copies and cause stores extreme losses by using coupons that would not be reimbursed.